I collect modelhorses. This is a wonderful hobby, filled with interesting things to do and friendly people. You can learn many things through it, and have lots of fun. If you're interested in learning more about this fascinating hobby, don't hesitate to contact me. Green Heaven is the name of my model horse "farm". I mostly collect Animal Artistry. I'm also involved in what sometimes is called "Pedigree Assignment". At the IPABRA you can read more about what PA is. In the links below you can find information about most of my horses and my longears. If you'd like to use any of my horses as a parent, please read my terms first. I am currently looking for a couple of models to add to my collection. They are listed on my Top Ten Wishing List. I yearly hold the Waterfestival Liveshow. More information about this show can be found here: Vattenshowen. I have the GH sale deposit, for pedigrees. This is only available in Swedish though: försäljningsdepån. I also have the Svenska Modell Hackney Häst/Ponny Registret (enbart på Svenska), the Svenska Modell Friesian Sporthorse Registret (enbart på Svenska), the Svenska Modell Arabhäst Registret, the Svenska Modell Suffolk Punch Registret and the Svenska Modell Fullblods Galoppen. I have a couple of models for sale, too. On occasion I do arab halters. They have even won at liveshow! Here's a link to pictures of a few Arab halters. Here is a Tour of my home. I'm also a member of the Swedish Model Horse Society (Svenska Modellhästföreningen). I seldom remake myself. Here are some pictures of some of my works in progress. My e-mail address is annelimell@gmail.com. PLEASE NOTE: This web page is part of a model horse hobby web site. 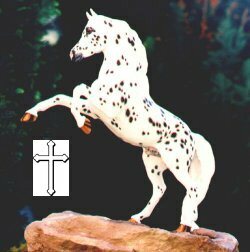 Green Heaven-owned horses referred to in these pages are NOT real; they are model horses or paper identities only. Any real horses discussed in these pages are listed for pedigree research purposes only and are denoted with a -r after their names.